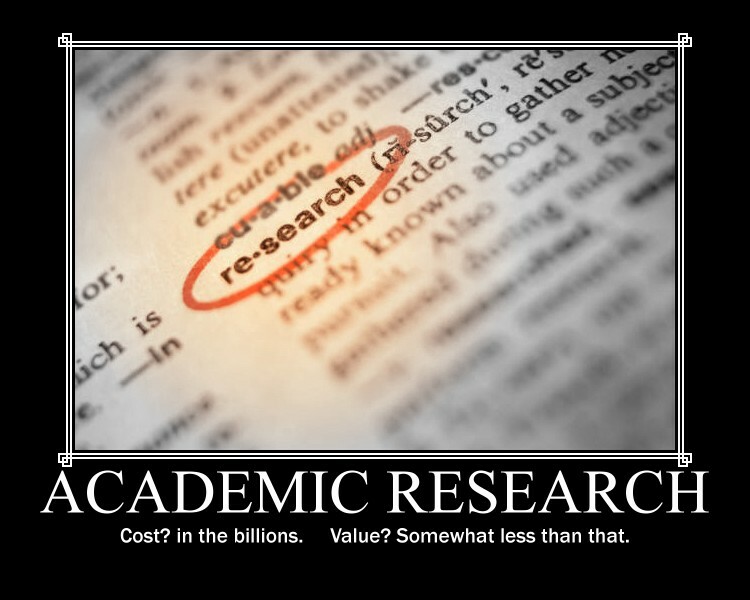 The $10K Degree – What About Scholarly Research? This is the eighth post in a series of undetermined length. All posts are categorized as $10K Degree. Let’s say that the mythical Rick Perry University (RPU) will be offering $10,000 baccalaureate degrees to those students who decide that RPU is just the type of educational opportunity they’ve been looking for (whatever that might be). Can RPU afford to do much scholarly research and still keep their costs down to a level that allows for $10,000 tuition over 4 years? Some faculty and other academic researchers are able to attract external funding for special research projects. Those external funding sources can often result in some dollars making their way into the general fund, thereby helping pay the costs of running the institution and keep down the price of tuition. That’s one avenue for funding academic research. The other main avenue for academic research is just the standard requirement related to “publish or perish.” In this case, almost all tenured and tenure-track professors (especially those of the Assistant or Associate varieties) are expected to spend a significant amount of their perspiration on the creation of scholarly research that gets published in the various academic journals (that nobody else in the world reads). The cost of this research is paid for from the general budget – it’s just part of the salaries paid to those employees. When I say that it comes from the general budget – that means that it comes from student tuition dollars and taxpayers funds from the state allocation. Previously I posted some thoughts about whether it makes sense for public institutions (and the taxpayers and students who fund them) to pay such large sums for research. The field that I picked on was my former teaching field – Accounting. One question posed was “why should the state of Minnesota (insert your state here) pay a hundred (or more) people to conduct research in accounting?” Wouldn’t 2 or 3 accounting researchers pretty much cover it? That would still be 100-150 public employees doing accounting research when you factor in 2 or 3 from each of the 50 states. And doesn’t that still sound like a lot more than what is really needed? Faculty workloads vary considerably throughout the academy. At the universities where I have worked, the typical load for a professor is 6 credits of teaching per semester, and the rest engaged in research and “service.” Any teaching done above 12 credits in the year is considered overload and they receive additional pay. This is generally considered to be about a 50% teaching commitment and 50% research. YMMV. Caveat #1 – a fairly large percentage of faculty researchers that I have met (and worked with) over the years can’t teach their way out of a paper bag. So, proposing that they teach more is a double-edged sword. But here I go. What would be the financial impact of changing to a teaching-first type of workload for a university department? Let’s say that the accounting department at State U has 10 full-time professors. With each of them on a 50/50 teaching/research workload, the State U has the equivalence of 5 full-time researchers and 5 full-time classroom instructors, teaching a total of 120 credit hours per year (10 profs * 12 credits each). Out of those 10 faculty members you are now getting 204 credits taught during the typical year instead of 120. That means that an additional 84 credits (or twenty-eight 3-credit classes) are now taught by your tenured faculty rather than adjuncts and other hangers-on (phrase deleted for being too snarky. Sorry.). Can I just tell you that we are talking about a huge savings per year, or do I need to calculate it for you? Okay, maybe later. Recently released preliminary data from the University of Texas strongly suggest that the state of Texas could move towards making college more affordable by moderately increasing faculty emphasis on teaching. Looking only at the UT Austin campus, if the 80 percent of the faculty with the lowest teaching loads were to teach just half as much as the 20 percent with the highest loads, and if the savings were dedicated to tuition reduction, tuition could be cut by more than half (or, alternatively, state appropriations could be reduced even more—by as much as 75 percent). Moreover, other data suggest a strategy of reemphasizing the importance of the undergraduate teaching function can be done without importantly reducing outside research funding or productivity. You might think that the bottom 20% would generate more of UT’s research funding than the top 20%. You would be wrong. 2% of the faculty generate 57% of the research funding. The 2% mentioned directly above still teach about the average amount of student credit hours as the rest of the faculty. Is it just me, or does it seem that the other 98% should have some time on their hands where they could teach a lot more to earn their salaries? Yes, I know that this will be perceived by some as an anti-research rant. I’m not against academic research at all. I just have a very different perspective of how much is needed/wanted. I’d say that generally speaking, the amount of faculty time and salaries spent engaged in academic research is too much – by a factor of – say, 5 times! That’s right. I’m thinking we could do 20% of the current amount of research (led mainly by our “best” researchers), devote the rest of our resources to teaching (and hire faculty who know what they’re doing in the classroom) and we’d be able to keep the cost of tuition down to a reasonable amount. Keep in mind that I’m really only talking about state-funded universities here. If private schools want to engage in an absurd amount of research and can afford to do so – more power to ’em. The faculty who really don’t want to teach can get jobs with the privates. Taxpayer dollars would be better spent in funding excellent teaching at the public universities, and student tuition rates could be kept at much lower levels. I know that I’m wrong about this, but I’m not sure why. Any comments you would like to leave to help me see the light would be most appreciated. Interesting post with some compelling ideas. I agree that we think of ‘research’ in some strange ways. We use it, for instance, as a substitute for judgement or accountability… which i find frustrating. My only issue with your number is the supposition that the amount of dollars someone receives is related to the amount of valuable research they might be doing. If my research requires a largish hardron collider, or a research assistant, it’s going to make a certain amount of difference. Timely post, Barry. I’m part of a task force in my unit (School of Education) that is exploring “differentiated load.” This would allow departments to figure out where each faculty member is best suited and how it can meet its overall goals best. I don’t think we’ll go quite as far as you suggest (the 8-1-1 model), but I will share your thinking with my colleagues. Thanks for the comment Dave. I think you’re talking about the UT data (yes?) and how the referenced report indicates the % of faculty bringing what % of funding. If so, then we are in complete agreement about the need to focus on quality rather than quantity. I have no doubt that they picked quantity of dollars because it’s so much easier to measure. Doesn’t make it relevant though, does it? Jon, I’m definitely interested in that conversation about differentiated load. I left a university many years ago because I was “just” a full-time instructor in the accounting department. I left because they had a term limit (6 yrs) on those without doctorates in accounting (seriously, who the hell wants one of those?). The dept. head who hired me wanted to change the rules so that teaching specialists like me could get tenure if we did a good enough job where they didn’t want us to leave. My teaching abilities far exceeded the researchers in the dept – I believe there’s data to prove that. Some of the tenured faculty raised a ruckus and booted out the dept head and replaced him with one who believed that only faculty with doctorates should ever get tenure – and that their primary purpose was to research. It was that experience that pushed me into the community colleges where they valued someone who could actually teach. That was a far better place for me to be. Cheers.